A new specialized drone developed by two medical professionals may one day give ordinary people the ability to assist with simple first aid during natural disasters. 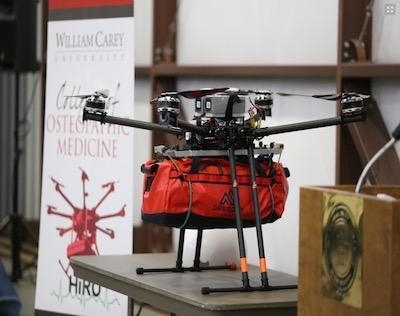 The drone, known as HiRO (Health Integrated Rescue Operations), is the work of Dr. Italo Subbarao, a disaster medicine expert and senior associate dean of William Carey University College of Osteopathic Medicine (WCUCOM), and Guy Paul Cooper Jr., a fourth-year medical student at WCUCOM. The drone was on display earlier this month at John Bell Williams Airport at Hinds Community College in Raymond, MS. According to information posted on the HCC website, the presentation was a mix of video and re-enactment. Students from WCU who played the part of shooting victims and potential caregivers in an emergency in the dramatization re-enacted those roles in person for the event. 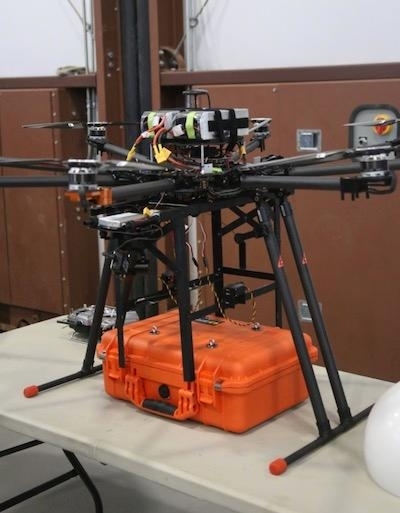 Experts from the college, along with Subbarao and Cooper, designed and built both disaster drones, capable of carrying telemedical packages in adverse conditions. The aircraft are owned by Hinds and built at the college-owned airport from components sourced from around the world, said Dennis Lott, director of the Unmanned Aerial Systems program at Hinds. Each UAV, popularly known as drones, held a telemedical package. One held supplies such as a tourniquet, chest seal, gauze, scissors and clotting sponge to treat a severely injured victim, while the other package is set up for a mass casualty and is capable of treating up to 100 people with a range of injuries. The aircraft are owned by Hinds and built at the college-owned airport from components sourced from around the world, said Dennis Lott, director of the Unmanned Aerial Systems program at Hinds. “These drones were specifically designed to support medical emergencies,” Lott said. Both kits incorporate the federal Department of Homeland Security’s recommendations provided through the “Stop the Bleed” initiative. “One thing we know for sure is that many people are dying in these types of events needlessly,” said Richard Patrick, a senior advisor for health policy with the department, noting research on active shooter events shows opportunities to save lives are there. When a critical care kit opens, a physician appears on video and can direct treatment via a Google Glass, which someone can wear and move away from the drone while keeping audio and visual contact with the physician. Further development needed to make telemedicine via the drones a routine part of disaster response includes integrating them into 911 response systems, Subbarao said. “From our perspective, we feel it’s a system being applied here – a system that will save people’s lives,” he said.